So not so long ago (two weeks ago to be exact) Guille and I decided to finally try the cool, modern, sleek restaurant located right next to The Broad, Otium. Now, I must say, every time I visit The Broad, I always think, next time I’m gonna remember to make a reservation and try that cool-looking place! (Honestly, without even reading a review or the menu, I just wanted to try this place.) Well, I finally did and I’m obsessed! As Guille’s dad was in town visiting, we decided to do something fun and different and bought tickets to see Gustavo Dudamel conduct the L.A Phil. Since we had tickets to see the Sunday show at 2:00pm, we thought we might as well eat brunch around the area, hence Otium. 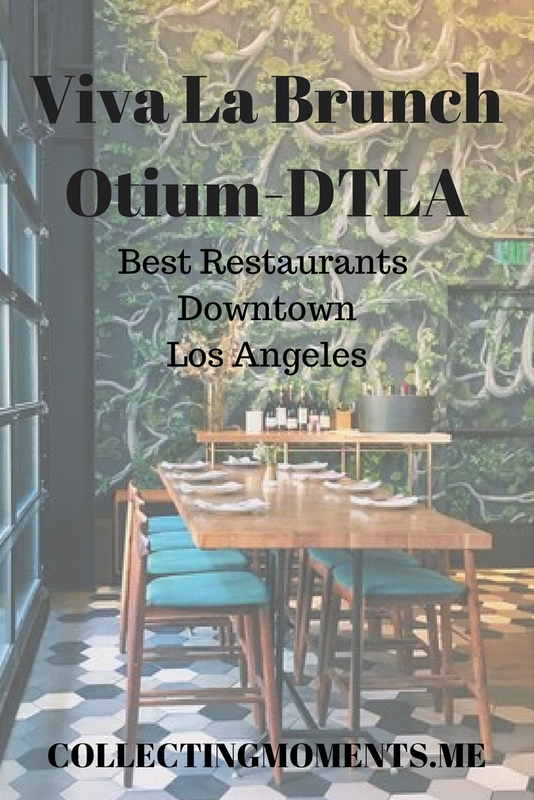 Every single detail about our time at Otium was spectacular! From the moment we walked in the door, we were greeted by the friendliest staff that asked us our preference for seating (indoor/outdoor) and then directed us to our table. I can’t even begin to explain how much I love the space! It has an industrial/modern feel, which I liked, but still had some unique homey touches such as delicate flowers and holiday decorations. The menu and food was perfect; simple yet distinctive. Now, what do I mean by that? The brunch menu was one small page, with a few options, but each and every one of them was completely different. We ordered some freshly baked Country Ciabatta for the table and crispy potatoes to share, and then the Beef Cheeks (swiss chard, jasmine rice, coconut, cashew and a surprise sunny side egg) and the Hoe Cake (Fried chicken, kale and maple butter). We accompanied ALL of this yumminess with some spicy bloody marys + coffee, and later order the two dessert options they had: a delicious ice cream sundae and a mille feuille. Everything was INCREDIBLE!!! I really encourage everyone to make a reservation. I must say though, it’s kind of a place to splurge on and have a nice date or outing with friends as plates are small and a bit pricey, but completely worth it!! I can’t wait to go again, keep collecting some amazing moments and let y’all know my thoughts!